There's never been a better time and place to social network than right now, and chances are, at any given 'right now', you'll have your phone to hand. The smartphone has therefore unsurprisingly become social networking's best friend. With that in mind, here are our top ten tips for social networking on arguably the smartest of phones, the Samsung GALAXY S4. The first step in any social networker's path to infamy is Facebook. Facebook is a network within which you connect with friends, make new friends and document every waking moment for the pleasure and pain of those you're Facebook friends with. Of course, how far you want to take it all is down to you, but whatever your degree of social exhibitionism, chances are, you'll benefit from having a Facebook profile to some degree. Events, for example, are easily organised on Facebook. The Facebook Messenger app on the Samsung GALAXY S4 makes the service a viable party-planning tool. Being reminded of loved ones birthdays can save a feud, and posting a birthday wish can simply make someone smile. Like chatting online with any of your mates whenever you fancy? Of course you do! Which is exactly why Samsung's own ChatON app is hugely popular. 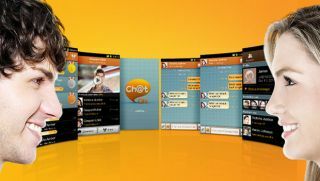 Samsung's ChatON is one of the best free instant messaging apps available on the Android platform. Introduced at IFA in Berlin back in August of 2011, ChatON became an instant hit with Samsung and Android fans, particularly due to the fact that it cleverly supports both 1-to-1 instant message chats and group chats. Plus, you can share tons of emoticons and create personalised animated messages, to help you pepper your IM chats with an extra bit of fun. And you can use ChatON via your web-browser on a computer, as well as your Android smartphone or tablet. Once you've scoped out Facebook and added people you know to one social network, it's time to check out Twitter, and follow people you don't on another social network. Twitter is generally less personal than Facebook. Rather than see friends' photo albums and relationship statuses, it's a great means of staying on top of current affairs, keeping tabs on movers and shakers relevant to your industry as well as having a good old rant – in 140 characters or less. The accounts you follow generate your news feed, and people can in turn follow you. The official Twitter app is always a safe bet to get tweeting on your GALAXY S4, though there are plenty of other apps in the Google Play Store, with Plume being a popular alternative for example. If you want more than 140 characters to express yourself online, a blog, coined from the term 'web log' is the way to go. Blogs are websites that act as an online journal, usually revolving around a topic. They're generally free to start up and vary in terms of the ease with which they can be set-up and maintained. Major blog providers even offer Android apps to ensure you can update your blog on the go, and what better phone to do it on than a Samsung GALAXY S4? Take TUMBLR for example. Create a free account and blog, select from a number of free or paid templates and hey presto, you've got the building blocks for an online outlet. To post from your smartphone is a doddle. If you're posting text, open the app and simply create a new post. If you want to post an image, just take a picture, and share it to the Tumblr app – it really is that easy. What isn't that easy is posting high quality pictures. Yes, the 13-megapixel camera on the Samsung GALAXY S4 is one sharp shooter, but a few rules of thumb will help your pictures pack a bit more pop.